Some things in nature are so breathtaking, they move us to try to create something equally beautiful to express and share our awe. Ansell Adams strove to capture the brooding majesty of the North American west on black and white film. John Muir did the same through layer after layer of eloquent descriptive narrative. Poets through eternity have tried to do justice to flowers and birds, lakes and mountains, the moon and stars, but in the end, Kilmer probably had it right; we will never see a poem as lovely as a tree. Happy as a lark! Why do we say that? Because the male Eurasian skylark (Alauda arvensis) has one of the most joyful songs in existence. And not only that, but he accompanies his song with an exuberant flight display, soaring high into the sky until his is a mere dot, singing all the while, and then plunging back to earth. Unsurprisingly, this exuberance has not gone unnoticed by poets and composers. 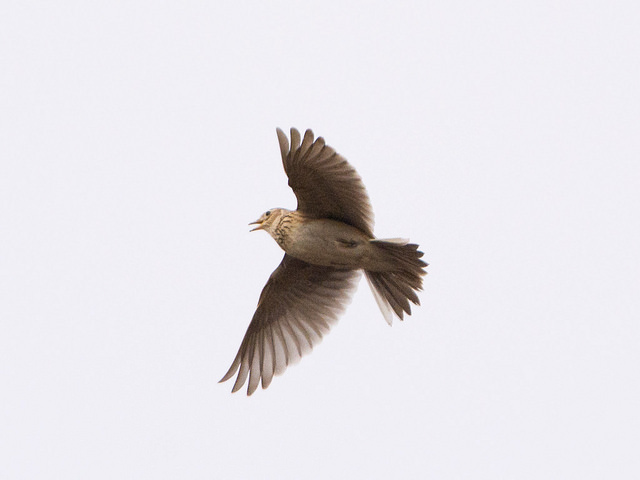 I’d like to share, today, some stunning interpretations of the song and flight of the skylark. Read the rest HERE and decide for yourself whether Meredith’s poem, or any of the musical interpretations are as lovely as a skylark’s ecstasy.